I mentioned a while back that I had commissioned a second suit from Graham Browne in London. And after rather too much travelling lately (Milan, Madrid, Dubai in a month; and Hong Kong next week) I’ve finally got around to watching the first step of it being made. It’s unlikely I will post quite so many photos of this suit in its construction and fittings, in that much will be similar to the last series. But whenever things are new, I will. Here, the most obvious novelty is the waistcoat. The suit is in 13-ounce, navy, chalk-striped flannel from Hunt & Winterbotham. The weight of the flannel means the stripe is rather fuzzy, which is how I prefer all stripes in suitings. (The only stripe I like is a bead stripe – anything too precise and without texture seems to look cheap.) The jacket is three-button, rolling to two, and the waistcoat has notched lapels with five buttons, rolling a little at the top as well. A new waistcoat pattern was cut for this suit, but not a new jacket pattern – my existing DB pattern being simply folded over to cut the SB jacket front panels. The waistcoat has a full, floating linen lining, something tailors rarely do these days. The linen gives structure and a shape that moulds to the chest, while not being too bulky. Russell and Dan report a lot more waistcoats being ordered these days. (Perhaps people have been reading the Logical Waistcoat Theory.) In fact they say they’ve made more in the past year than the past 10 years together. Problem is, there aren’t many waistcoat makers around any more. Graham Browne uses one lady and she is overworked. 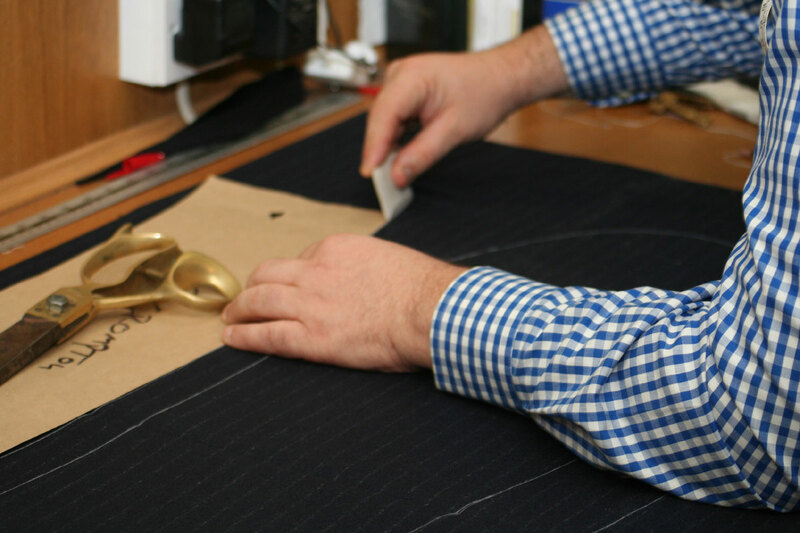 Jacket makers can make waistcoats as well but they dislike it, as the work is similar for less pay. The other issue with waistcoats is that men today wear their trousers a lot lower. The question for the tailor is: does he try and convince the client to have his trousers cut higher for a waistcoat, or make the waistcoat longer? Having a gap is not an option, but some men would resist the former, while the latter can make the body look too long. Russell says he leaves it up to the client to a certain extent, but there are limits. Also if you plan to wear a separate waistcoat with a suit, buy that or have it made first. One client of Graham Browne’s didn’t tell the tailors that he already had a fancy waistcoat he wanted to wear with this suit, so the trousers were not cut high enough. Always best to bring the waistcoat along, so the trousers can be cut appropriately. 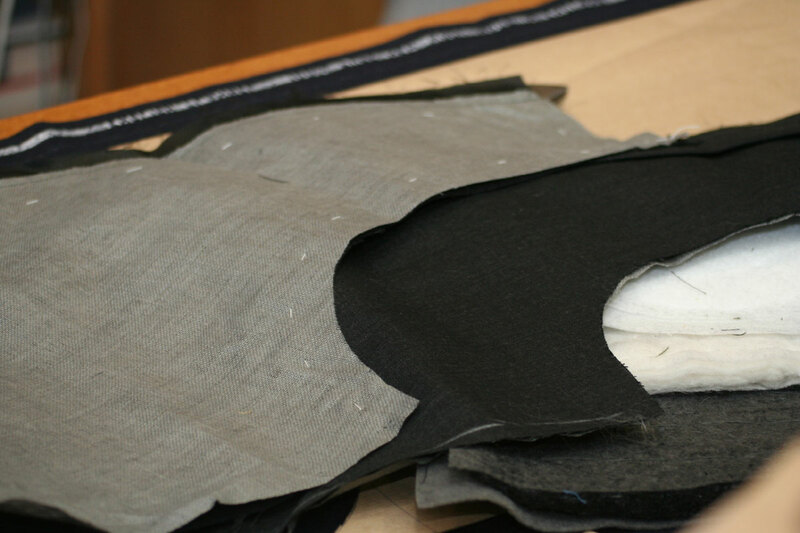 In the images here you can see the folded jacket pattern being placed on the cloth; the sleeve pattern being chalked on; the linen lining that will be used on the waistcoat; and finally the marked-up jacket. In the last picture those three horizontal lines you can see at the top left are the button placings. 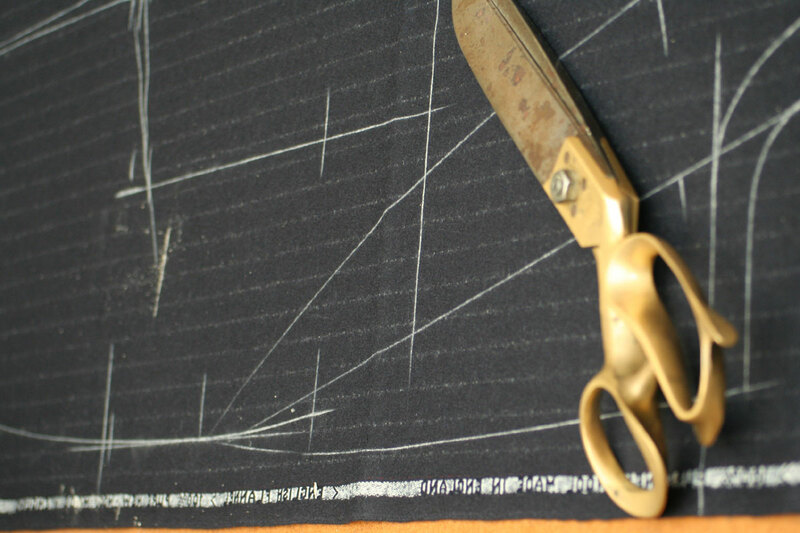 The curved line coming up into them (from underneath the middle of the scissors) is the edge of the jacket. Notice how it meets the vertical between the first two buttons, to take account of the roll (you’re looking down the jacket). You can follow the discussion on Second British bespoke, part 1 by entering your email address in the box below. You will then receive an email every time a new comment is added. These will also contain a link to a page where you can stop the alerts, and remove all of your related data from the site. Sounds like you’re really getting into this whole bespoke thing. I agree with the high-waist on suit trousers both with and without a waistcoat. With a waistcoat, as you say, it avoids an unsightly gap, but the same is true on without, as trousers which are too low can result in showing too much shirt (and tie-end) at the waist. High-waisted trousers are more comfortable as well. high waisted?=YES. But aren’t off the pegs just as good as Bespoke now? In my opinion, on fit, definitely not, no. Off the peg is not even close. Simon, while reading this an article in the NYT occurred to me: in fashion, the elements of style often become victim to the exaggerations you detail in your series on costume. Though I must say I’m glad to hear about the uptick in vests. They just look so smart. Your review of Graham Browne really makes a visit a compelling idea, as price/value seems remarkable. Is there any note of caution? I enjoy reading your blog tremendously and have been subscribing to it for some time. I would like to know more about using linen to line waistcoats. 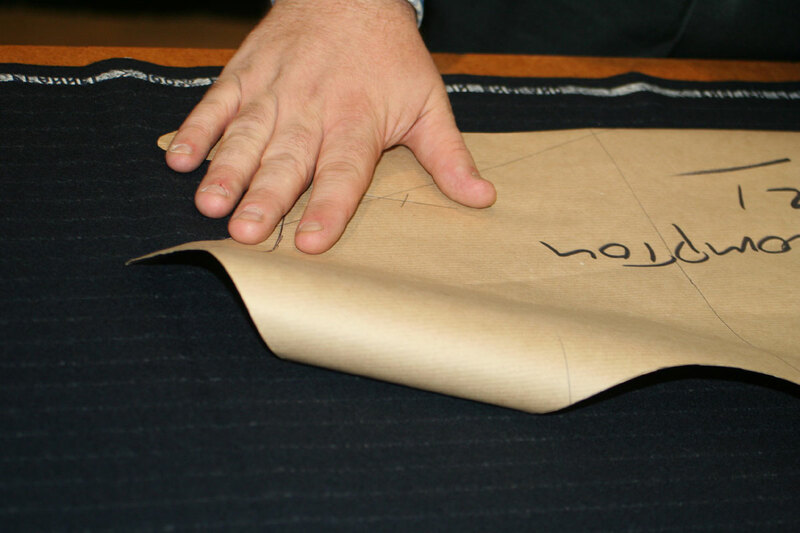 Can linen only be used to line waistcoats, or can it be used in suit jackets and pants as well (as a substitute for bemberg or viscose)? What sort of linen is used? My husband was given several expensive suits that are much larger than he wears. Is it possible to have the entire suit taken in, and will it be worth the effort? Have a look on the site for having suits altered. The answer is yes, as long as the shoulders fit ok and you don’t have to take in the waist by more than two inches or so. May I ask how many English made suits you have and who made them ? Sorry to have made this request, I have now found the post listing your clothing and the links to the makers . An excellent post. I’m thinking of having my first bespoke item made, a tweed jacket that I can wear with casual trousers, jeans. I don’t have an endless budget and after reading your posts I’m planning to use Graham Browne. Is this a good idea or are there others I should consider for the same cost ?